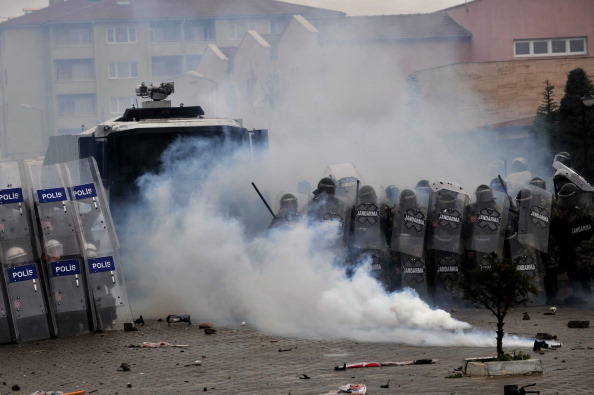 Turkish gendarmerie and riot police fire water cannon and tear gas as they clash with hundreds of protesters trying to enter a courthouse in Silivri near Istanbul (Photo Credit: Ozan Kose/AFP/Getty Images). The Ergenekon trial, which came to a close this week, is without question, one of the most important court cases in Turkish history. The case involved an alleged coup plot against the ruling Justice and Development Party (AKP) and the successful prosecution would seem another chapter in the AKP’s important efforts in reigning in illegal and anti-democratic actions by the Turkish armed services. I’d like this to be a simple story of military power being brought under the control of an elected civilian government. Unfortunately, the Ergenekon story is also one of missed opportunities and justice denied. The Ergenekon trial had enormous potential to uncover the crimes of the past and set the tone for real justice in the new Turkey. It failed on both these accounts. The problem is that the absolutely healthy process of asserting civilian control is being undertaken by a political party that has shown an unhealthy willingness to politicize the bureaucracy [and, I might have added, the judiciary] and a marked intolerance for dissent. 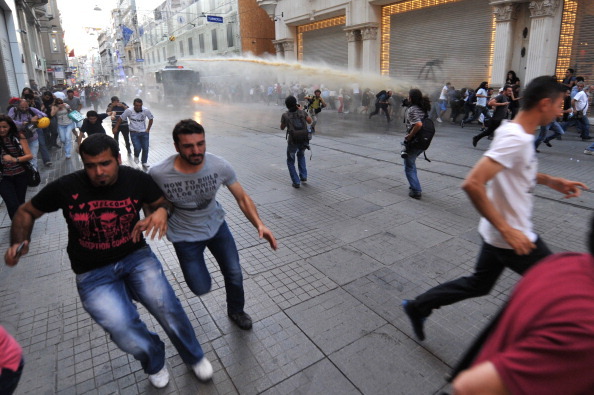 Turkish riot use water cannon to disperse anti-government protestors during clashes at Istiklal street on (Photo Credit: Ozan Kose/AFP/Getty Images). [The] court failed to look into allegations that a core group of defendants was responsible for serious human rights abuses in the areas of the country where they served in the 1980s and 1990s: torture, and thousands of enforced disappearances, killings and illegal village evacuations in the southeast, as well as political assassinations in the western part of the country. The trial also failed to look at these defendants’ possible involvement in clandestine networks connected with the state in much more recent political assassinations, such as the January 2007 murder of the journalist Hrant Dink, or the April 2007 killing of three Christians in Malatya. One defendant, Hursit Tolon, is on trial separately in connection with the Malatya murders. As we have seen by the abysmal response of Turkish authorities to excessive force by police this past summer, the culture of impunity is alive and well in Turkey. Sinclair-Webb also highlights the other major problem of the Ergenekon trial: tried under sloppy anti-terrorism statutes in a Special Heavy Penal Court which allows too few rights to defendants, there are fundamental questions about the trial’s fairness. The Ergenekon proceedings were also overshadowed by concerns about the fairness of the trial. These ranged from questions about the flimsy nature of evidence against some defendants, the implications for media freedom arising from the prosecution of journalists as coup plotters, concerns about the appropriateness of the application of terrorism charges, objections to the misuse of protected witnesses, which impeded the defendants’ ability to challenge the evidence against them, and in particular the prolonged pretrial detention of some defendants. Some saw the trial as no more than a witch hunt by the governing AKP against its political opponents. These problems are not, of course, limited to just the Ergenekon trial. Thousands of the left and right have had their rights trampled by politicized courts and dangerously vague anti-terrorism statutes. Over the years human rights groups have repeatedly expressed serious concerns about the fairness of trials in Turkey, in particular those held in special courts dealing with terrorism and organized crime. Such courts and trials follow a practice of virtually mandatory pretrial detention for extended periods. So although these are not new concerns, they have deepened with the proliferation in recent years of “mass trials” – with multiple defendants alleged to have been part of terrorist groups. The thousands of people on trial for alleged membership in the Union of Kurdistan Communities and association with the Kurdistan Workers’ Party face even less fair proceedings and flimsier evidence, with a large number still held in prolonged detention pending verdicts. The AKP-led government has adopted a series of “judicial reform packages” aimed at mitigating the worst abuses. Yet the broad and vague nature of “terrorism” offenses and the use of special courts to try these cases have left the problems largely in place. The Ergenekon trial has been lauded by Turkish government officials as the foundation for a new era in Turkey. Unfortunately, it has failed to address fundamental questions of past crimes and failed to offer the accused a basic standard of justice. The new era has gotten off to a very shaky start. This entry was posted in Censorship and Free Speech, Europe, Military, Police and Arms, Prisoners and People at Risk and tagged abuses by armed groups, accountability for torture, censorship and free speech, detention and imprisonment, Europe, fair trials, human rights defenders, illegal and indefinite detention, Internet Censorship, Military Police and Arms, press freedom, prisoners and people at risk, reparations for vctims, Turkey by Howard Eissenstat. Bookmark the permalink. Two wrongs does not make one right. AKP established allowed the continuance of an unfair and vengeful justice system that is is repeating the same opressive and inhuman mistakes made in the past by the military and the authoritian govenment system. The justice system in Turkey does not work. What do you expect from a system where the government is the prosecuter, judge, and the executioner. Consider that before the Balkan Wars, literacy in the Ottoman Empire stood at 10%. Before WW1 at 5%, and thereafter at 2.5%. We have come a long way in the Republic of Turkey. You people of the west would be hard pressed to comprehend this, so you should try to better judge when to engage and when to lay off. But then, most of you are new rich peasants too. This is definitely not a new era, stupid. Same machine, new driver. Congrats. It looks to me like the authorities are afraid of the power people could have and that's why they are so violent. But this will not solve their problems.